Our university’s innovative MITS degree program is one of only a few specialized information technology (IT) security graduate degrees available in the world. Through theory and applied learning, the MITS program will enable you to develop an extensive understanding of business and IT security in a team learning environment. The curriculum contains most of the domains found in the Certified Information Systems Security Professional (CISSP) exam and in the SysAdmin, Audit, Networking and Security (SANS) Essentials course. The MITS program is 12 months long, based upon full-time study. 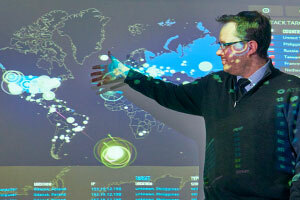 Students in the MITS program complete laboratory assignments that simulate a variety of attack-and-defence scenarios. One student team may attempt to secure an information system using available hardware and software tools, while another student team endeavours to compromise the system as it was designed. Alternatively, a team may be assigned to undertake a forensic analysis of a compromised system. This simulated network environment provides you with an opportunity to gain exposure to different aspects of IT security. The Faculty of Business and Information Technology houses a wide collection of leading-edge laboratories to enhance the learning experience and provide students with the hands-on skills and knowledge they will need in the world of IT security. For more information, please call 905.721.8668 ext. 2830 to be directed to a School of Graduate and Postdoctoral Studies (SGPS) representative, email mits@uoit.ca, or visit the SGPS website.